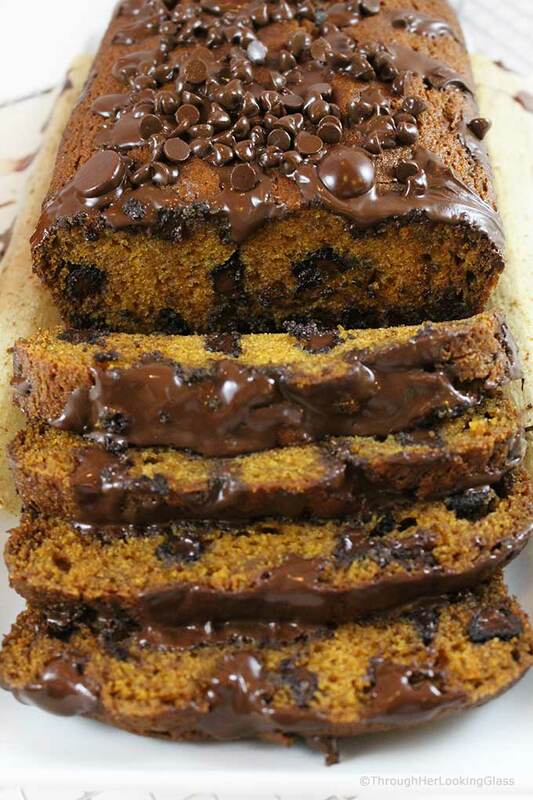 Pumpkin Chocolate Chip Bread: moist, tender pumpkin bread, studded throughout with chocolate chips! Perfect sweet nibble with an afternoon cup of tea. 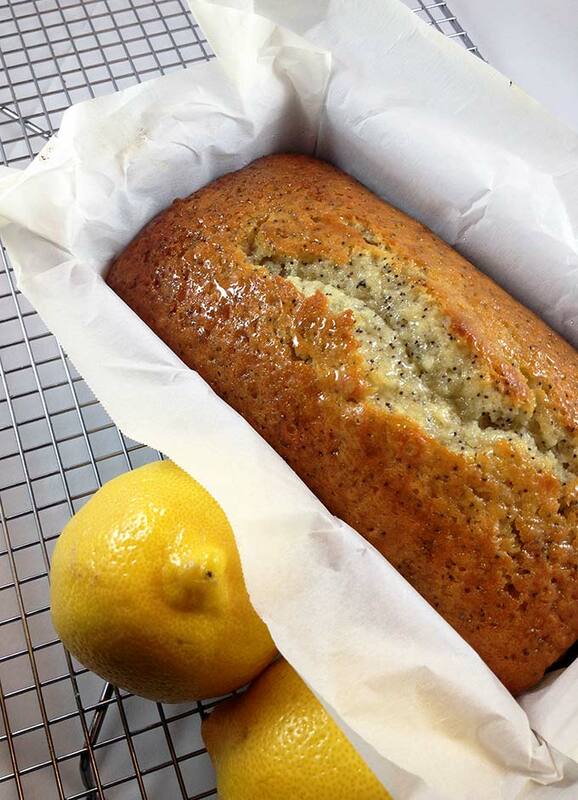 This easy quick bread recipe makes two generous loaves, one for you, one for a friend! I tend to be an all or nothing kind of girl. Maybe that’s why I couldn’t resist topping off this Pumpkin Chocolate Chip Bread with a generous sprinkle of extra chocolate chips after baking. The chips got all melty and made a scrumptious chocolate “crust” on top! Fall is finally arriving here in New Hampshire. The days have been warmer than usual, but the nights have been cool enough to coax out the bright colors. There’s nothing more beautiful to me in autumn than the vivid reflections in a still pond or lake. Like a painting. The days have been full around here as I’m sure they have been at your house too! There’s always a bit of commotion at the beginning of the school year with a new schedule and various sports, classes and activities starting. Corn husks and mums flank my front door now, and pumpkins sit on the steps. I mentioned in my last post that we were looking for a very special kind of dog for Hudson. (Hudson is our youngest with special needs.) The excellent news is, that after twenty-four years of being the solo girl in the house, I’m no longer alone! Wahoo. Her name is Chloe and she’s got four furry legs, an enormous pink tongue and chocolate brown cow eyes. Need I say more? She’s a beautiful yellow lab we found at a nearby rescue. Finding Chloe was like finding a needle in a haystack. Most of the dog rescues have puppies, but we needed a very special CALM dog for Hudson. I researched the inventory of thirty different rescues before I found her. They say she’s five, but I think she’s probably older. And that’s ok.
She’s the sweetest, gentlest dog you can imagine. You may remember that Hudson is terrified of dogs. So the day he came home from school and discovered Chloe here, he hid in my office for most of the afternoon. But the wonderful thing is, that nearly a week in now, Hudson is acclimating amazingly well. Chloe has been so patient, wagging her tail at him hopefully from a distance. In fact, I spied Hudson sneaking her a piece of his hamburger under the dinner table a few nights ago, followed by a little pat. So as you can imagine, there’s lots of promise for both Chloe and Hudson in this budding new relationship. (!) We are incredibly grateful things are going so well. 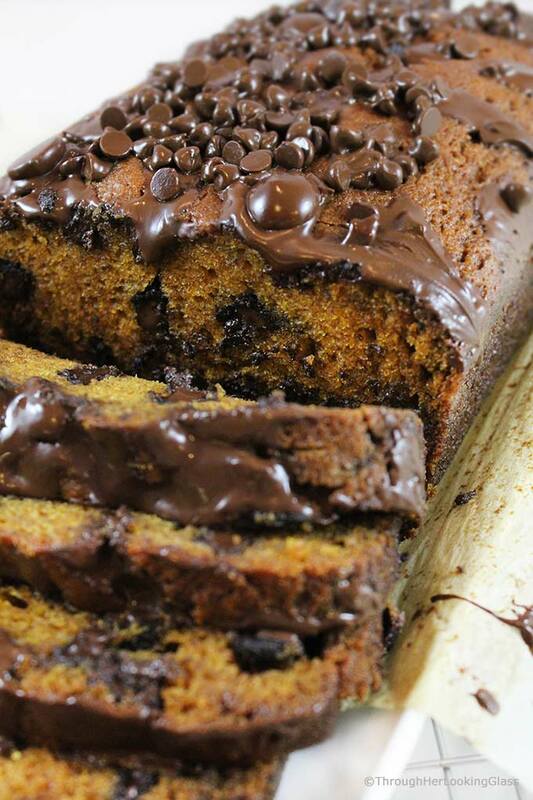 So my aunt and uncle dropped by as they were passing through town this past weekend, and I shared some of this scrumptious Pumpkin Chocolate Chip Bread with them. My aunt’s eyes twinkled as she pulled out the harvest loaf with chocolate chips that she had baked for us! So funny, we’re definitely on the same page here. Don’t over mix! You won’t even need your electric mixer for this recipe. Add in a cup of chopped walnuts or pecans if desired. 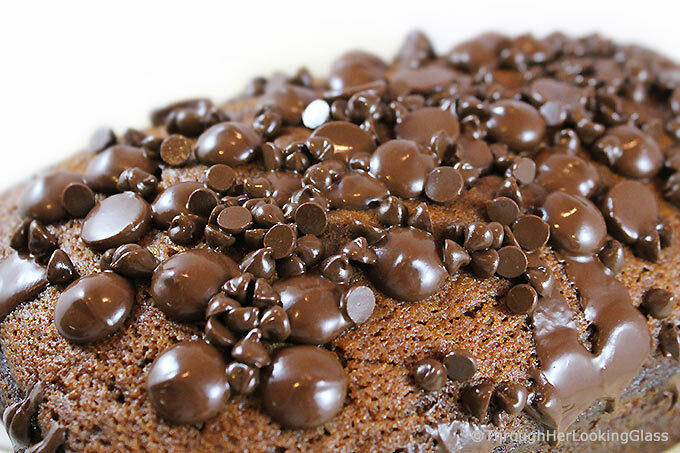 Optional: Sprinkle on extra chocolate chips immediately after baking for a special treat. 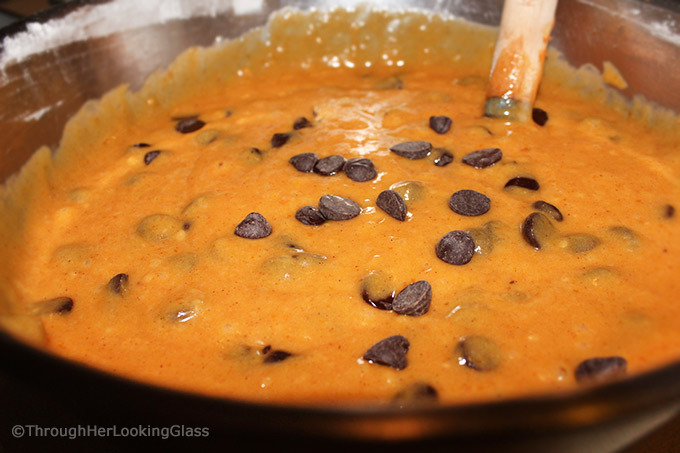 Optional: extra 1/2 cup chocolate chips for sprinkling on top after baking. Grease and lightly flour (or line with parchment paper as I did) two, 9" by 5"metal loaf pans. Set aside. In large mixing bowl, whisk together 4 eggs and oil. Stir in sugar until well combined. Stir in canned pumpkin and water until thoroughly combined. In small mixing bowl, stir together flour, pumpkin spice, baking soda and salt. Stir flour mixture into wet ingredients until just combined. Pour into the two 9" by 5" prepared loaf pans. Bake at 350° for an hour and fifteen minutes or until cake tester comes out clean. Optional: sprinkle with extra chocolate chips immediately after removing from the oven. Let loaves cool for about thirty minutes before loosening edges with a sharp knife and removing from the pan. Enjoy this bread warm or cool completely before slicing. This is one hell of a treat, Allie! My mouth is watering right now! Can I use almond flour? Thanks Agness - I have NOT tried almond flour in this recipe, so I don't know. You could definitely try it, but it won't rise as high because almond flour doesn't have gluten. Almond flour is also denser than all purpose, so the texture would be different too. I'm SO GLAD Hudson is getting comfortable with Chloe. She sounds perfect for him!! And yay for another girl in the house...even if she has four legs and fur. ;) So very thankful for you all. Now on to the recipe...I'm not a huge fan of mixing my chocolate with too many things, but this does look pretty darn good! Knew there was a reason why I picked up a can of pumpkin the other day...look forward to trying this yummy looking recipe...will take it to our small group soon. Our son, Mark and his family, also have a Chloe, a springer spaniel, who just gave birth to nine adorable pups. Go for it, Hudson, she will be your faithful friend!!! Hope you enjoy this bread Ruth Anne and so good to hear from you. Nine puppies - how fun! After we named Chloe, I looked at the list of the top 100 dog names. Who would have even guessed there is even a list of the top 100 dog names. But Chloe is on the list! Springer spaniels are the best. There is a pair of them that lives in our neighborhood and they are so cute and have great personalities. Hope all is well, and please tell Herb hello. Ooooh, love these healthier alternative ingredients—coconut oil/sugar! Busy chasing Harvey Weinstein’s skirts—here in crazy Hollywood???? but will look forward to trying that recipe when back in New England, safe and sound????! Between Weinstein and the wildfires.... STAY SAFE!!! I'm so glad you found the perfect dog for your family. We're on our second lab---they are so sweet! 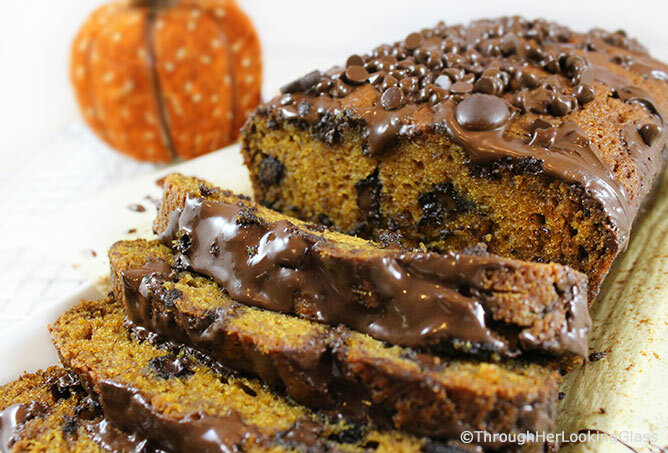 And your pumpkin bread with the double dose of chocolate looks amazing! I don't know which excites me more, dog meets boy, or chocolate chip pumpkin bread. Today the dog and boy...but tomorrow the scrumptious treat! I'm so happy for new horizons at your house, and new recipes at mine. Your saucy sister arrives momentarily! ???????? This looks beautifully decadent! Adding chocolate to this fall staple is one of my favorite ways to eat it! Luci’s Morsels | fashion. food. frivolity. Haha, that's too funny! That happened to me at work the other day. I baked one of my colleagues some cookies ans she did the same for me. The pumpkin and chocolate combo is one of my favourites!! Je suis sous le charme de ton cake Allie, de la gourmandise à l'état pur, superbe, gros bisous, belle journée! So nice you found Chloe for Hudson! And your pumpkin bread looks so delicious! I made a disgusting pumpkin bread a few weeks ago, totally unrisen, wet and sooo impossibly sweet! I had to throw it all away. I was thinking it went so wrong because I roasted and pureed my own pumpkin instead of using the pureed pumpkin from the can. Trouble is we don't have any cans of pumpkin in Germany, so I thought making my own puree should be ok. Do you think that was my mistake? Is canned pumpkin different than baked and pureed pumpkin? Thank you, Allie, I will keep that in mind for next time. It was probably that, my puree was not very dry. There is nothing lovelier than a fall day in New Hampshire. That is unless it is a fall day that includes a slice of your chocolate chip pumpkin bread...it looks yummy with that chocolate crust. Made a batch of this today and for the first time since moving in 6 weeks ago, our house finally smells like home! Can’t wait to hear more about Chloe - think of you all often!